In recent years, over 200,000 kids in us are sent to an emergency room for an urgent treatment due to the injuries on the playground[i]. In 2003, the hospital emergency room treated over 208,100 children, who got injured from playground equipment[ii]. Among those injuries, falls from playgrounds equipment are the biggest single hazard pattern. And according to the related research, swinging composes the majority of the fall. In order to create a safer environment on playgrounds, the US Consumer Product Safety Commission made a Public Playground Safety Handbook suitable for American citizens. Also, ASTM International has published voluntary technical manufacturing standards suitable for all international manufacturers. 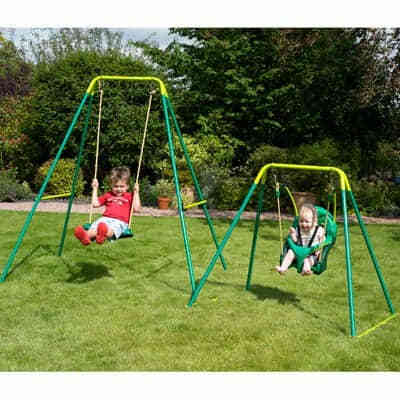 In this article, part of the guidelines recommended by the Consumer Product Safety Commission and the ASTM are presented herein to give you some advice when you are involved in swinging activities. Single axis: Some people would like to call in another way, to-fro swing. A single swing always stays in a back and forth motion in the same plane. It consists of one basic seat and a minimum of two suspending members. Each of these members attaches closely to an individual pivot on an overhead erection. Multi-axis: This kind of swing usually consists of a single seat, which is suspended from solely one pivot. Under this circumstance, you can swing in any direction. This article will just talk about the general recommendation regardless of the swing types. Whether the swing equipment is reliable or not would undoubtedly be the first thing you need to check out to guarantee your child’s safety. The hardware of suspending components, S-hooks, and ropes have to be involved in your checking list. The hardware: Hardware used to assure the suspending components to the supporting structure and to the swing seat can be removed only by specific tools. Ropes: Fiber ropes is not a good choice due to they may degrade after a period. For example, the ropes made of polypropylene would be the best partners for a tree swing. The safe distance includes two types of distances, which refers to the “inner distance” and the “mutual distance”. The inner distance is about the distance between two swings suspended on a single erection, while the mutual distance refers to the distance between the swing and other activities. The distance between a swing and its supporting structure (recommended):20 inches for toddlers (full-bucket will be needed), 30 inches for preschool-ages, 30 inches for school-ages. The required distance between two swings is respectively (recommended):20 inches, 24 inches, 24 inches. The allows access: the distance between the swing and the ground are separately (recommended):24inches, 12 inches, 12 inches. other activities or equipment around the swing, which looks attractive for young children, may accidentally lead those children to run into the path of a working swing. And that would cause an injury or fatal. We can build a hedge or fence to prevent this kind of accident. The size of the hedge should equal to the grith of your swing area. One more thing to remind you is that you shall not build those blockade to a height that will block your vision from your child. In general, falls always come accidentally in different ways no matter how much you have done for precaution. So, a protective surface would be important for the reduction of harms caused by the fall. Followings are several aspects to judge whether the surface is protective enough or not at all. Materials: Mulch, wood chips, pea gravel, sand, rubber mats or shredded tires would be the ideal choice to make a surface to reduce as much harm as possible. Clear up the ground: Make sure zero dangerous materials, for example, twisted metal or broken glass, to reduce the additional harm. Make a right surface: if you are going to swing on a hard surface (like concrete or asphalt), you should put 3-6 inches of loose-fill on the hard face first,[vi] such as a layer of loose-fill surfacing material, a layer of geotextile cloth, gravel and something like these. Then you should put impact mats on the loose-fill surface. Swing in the right way: Behaviors like jumping down from the swing sets, kneeling or standing on the swing sets, will be an invitation for injuries. So tell your kids to sit on the kids swing sets with their two hands attached closely with the ropes. They can only get off when the swing stops completely. Then other kids are swinging, they should stay away from the swing. Parents’ supervision can help avoid those unnecessary injuries by ensuring the child use the swing equipment rightly and don’t engage in dangerous behavior around a moving swing. Also, with your supervision, you can offer kids your help in time when an accident happens. As we all know, kids can’t always estimate the distances accurately, which often cause a collision. Even more, they are not able to foresee the coming risks by themselves. Besides this, older kids tend to test their limits when they are swinging, and sometimes they will put themselves to a dangerous position. Considering all the above situations, an adult’s supervision is an essential part of the swinging process. Get both the reliable equipment and your supervision in place, and equip your child with professional knowledge, there will be a safe and happy swing waiting for your family. This entry was posted in blog and tagged swing safety.